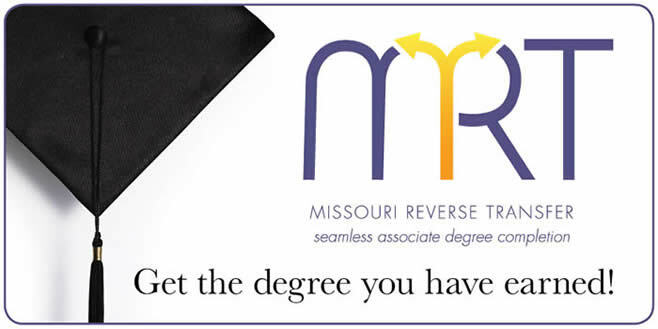 Missouri Reverse Transfer (MRT) is the process of allowing students who have completed credits towards an associates degree at a Missouri 2-year college to receive that degree while enrolled at Northwest. Missouri has moved forward with a statewide policy to help more Missourians earn degrees. Northwest will work with students to help send transcripts to our partner two-year institutions in order to facilitate the reverse transfer process. For more detailed information on Missouri Reverse Transfer take a look at the Missouri Department of Higher Education website. You must have earned a minimum of 15 credit hours at a single Missouri two-year institution to be eligible for a reverse transfer degree. Students are not eligible for the program if they currently possess an associates degree or higher. How does Northwest Missouri State University help you with Reverse Transfer? Northwest will work with students to help send transcripts to our partner 2-year institutions in order to facilitate the reverse transfer process. Contact either Northwest's or your former 2-year college Reverse Transfer Coordinator or review the FAQ. What do you need to do to participate in Reverse Transfer? Missouri Reverse Transfer should be a seamless and easy process for you, the student. By opting-in to this program, you have given Northwest permission to share your transcript with your community college. Once the community college receives your Northwest transcript, you will be contacted via email confirming your participation in the reverse transfer process. To opt-in, please follow the steps below. Click the blue Opt-In to MRT button. You will be prompted to login to CatPAWS. Once logged in, click on the Student tab. Go to the Student Records box, and click on the Missouri Reverse Transfer Opt-In Application in the bottom, left-hand corner. Fill out the required information, initial, and agree to the terms and conditions to submit your application. Northwest’s Missouri Reverse Transfer Coordinator will contact you upon receipt of your opt-in application.